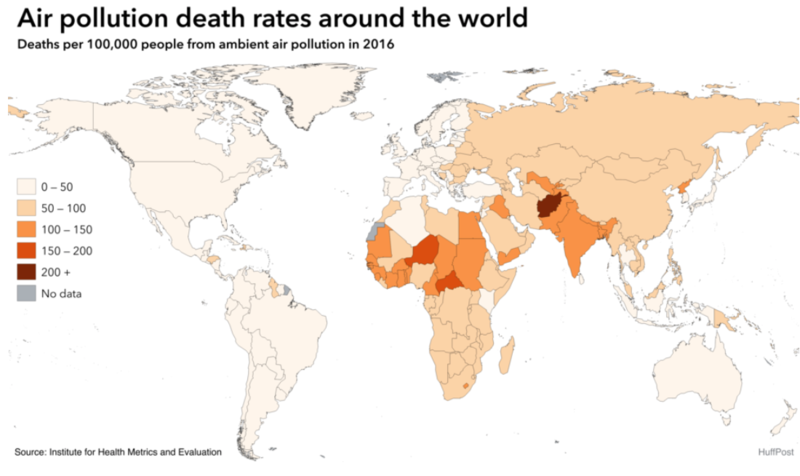 As many as 1.6 million deaths were attributable to air pollution in India in 2016, according to IHME. That same year, all air pollution was linked to almost 123 out of every 100,000 deaths in the country—among the highest in the world. “The right to breathe is, you would think, the most fundamental right—more than food, more than water. And that right is being seriously compromised right now,” Sharma told NPR. Climate change also contributes to air pollution trends—hotter temperatures increase wildfire risk, and wildfires create ambient air pollution. It also increases ground-level ozone, which is a main ingredient in urban smog, and can trigger health problems like chest pain, throat irritation and lung inflammation, according to the Environmental Protection Agency.